"I'm not sick, I do not feel so...At school I have many friends and I love to tell them stories. I also love to dance, I move a lot the bum and I hit on the chair like a drum. I’m really looking forward to playing and learning, dancing, laughing and meeting a lot of new friends. I'm happy. So when adults talk about that I have a rare disease, I do not understand them, because I'm not in bed, I go to school and I'm not sad. This year on Rare Diseases day, when HRH Princess Letizia chaired the meeting, Lucas and his family raised awareness about people living with Osteogenesis Imperfecta. Blanca and Lucas’ words had more impact on the public than other years and their story touched the whole country. Suddenly, Lucas became the famous "brittle bone child" of Spain - there were press news and we could see Lucas in television and magazines. He appeared in the Ana Rosa Quintana’s show, the most-watched morning show on national television. "I will be your voice". That is the power of raising awareness! Two little boys met their Princess and the whole country of Spain found out more about OI!! 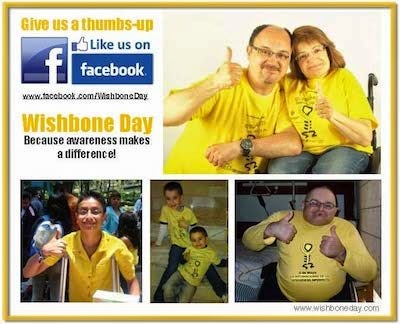 Like Lucas, Anton and their family in Spain, you too can raise awareness on 6 May – Wishbone Day – because awareness makes a difference!